So here it is again, Autumn. It is too bad that the camera on my phone couldn’t quite capture the orange leaves that had fallen on my greenhouse roof outside my window. The colour matched the enamel pot on my worktable. It is mug season! And large wine carafes too! Yes, the season of giving will soon be upon us and one must prepare. I have been preparing for months but still I like to push my panic button every now and then. My motto is “Pressure Makes Diamonds”, which in my case is true! I have been continuing with my collection of ‘vintage’ mugs and platters celebrating Guelph’s ‘vintage’ neighbourhoods. Notorious places such as The Ward, Exhibition, St. George’s, The Junction (Yes, Guelph has its own Junction) and more. I have made a mug for Sunny Acres for those who love the park and for those who perhaps have never visited I have created Little Britain instead. So many of the street names originate in the UK, plus it is a nod to the show which I get a giggle out of. Perhaps now though I should make a Little Brexit version too (all things are possible and if you want one, send me a message!). I hear people say that blogging is done and dusted. But for now, when I get friendly reminders that I have been forgetful in updating my blog (thanks Dad), I will pop up every now and then and keep you posted. Finally, the final piece to complete my studio. Flashy, reflective armor plate behind my woodstove! Thanks to my ‘handyman’ for cutting and installation. It has really brightened up that corner and inspired me to get back to creating! It was a serious eyesore before with the grey cement board which bothered me for years!! Phew, it is done, the fire is heating up the studio and I can get a handle on things. Good news! I have a new ‘proper’ website up and running. Search for BunnySafariPottery.com and see what I have been up to. Fresh new work will be coming in the next couple of months. Have a grand February day! Have you ever imagined what it would be like sharing a pot of tea with Edgar Allan Poe? It might rather glum and somewhat frightful. Best to serve chamomile tea to calm the morbid mind. Maybe invite a trusted therapist to the occasion too (more for me, than him). Well, we won’t be able to bother him with our trivial problems, however, we can still enjoy a pot of tea made in an original handcrafted teapot. Bottoms up! Yes, dear readers, a photo of me doing some work! 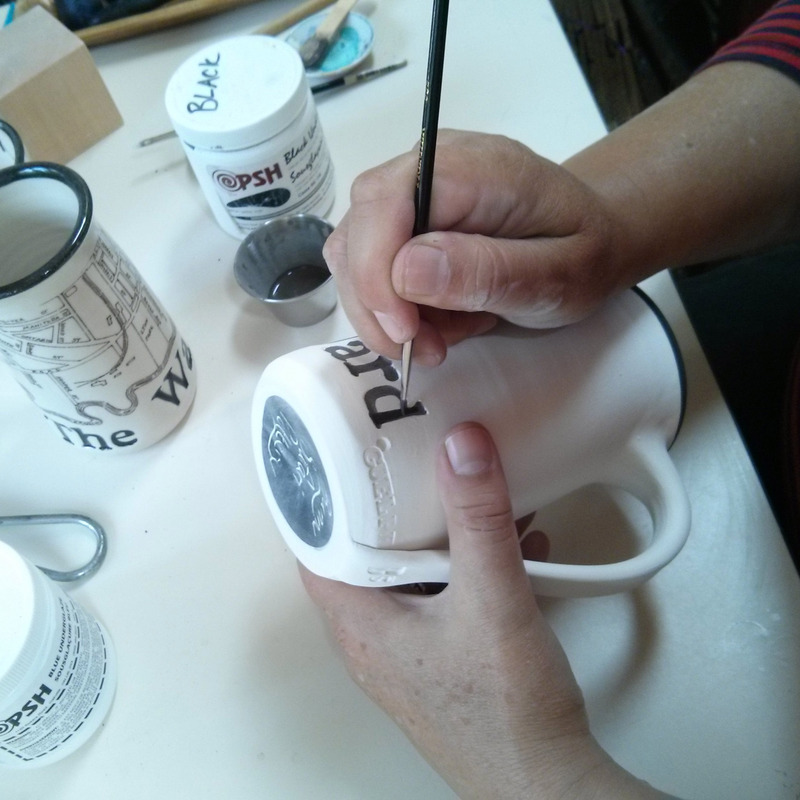 I have been busily creating lots and lots of neighbourhood mugs for some of favourite neighbours in the City of Guelph. Currently I have The Ward, Exhibition Park, old St. George’s covered. I am working on some of the other older ‘hoods too. Officially, we have now entered ‘the mad season’ of getting prepared for that date at the end of December that all the big shops start promoting ad nauseam!!! I have also decided to have another online retail location over at http://www.bunnysafaripottery.com to help the Canadian collectors of my work. Why? The US dollar is so expensive that I feel the pain of trying to buy something from the US (for me that would be purchasing film…..). This way, all my prices are in Canadian $$ for items in the shop. Stay tuned for some more fun photos and I will get back to making more pots!! I’m done!! I have finally finished!! Thanks to Frans Rood, a Raku potter extraordinaire. 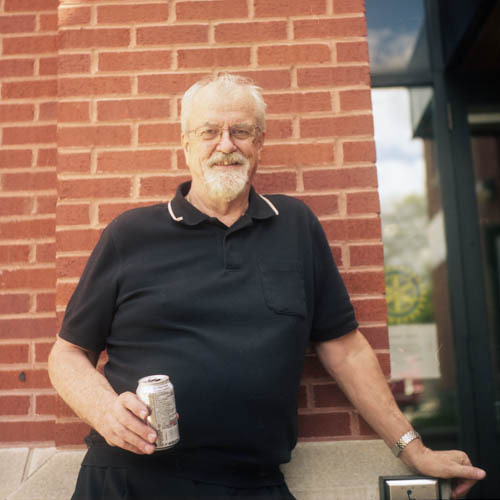 I actually met Frans last November at the Hamilton Potters Guild sale and I forgot to bring my film camera! 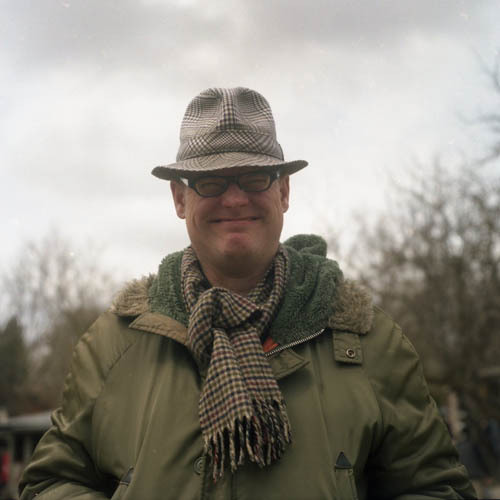 Frans knows film and darkrooms. He used to have a state of the art darkroom that cost a pretty penny to purchase. Unfortunately, there were not pennies when he had to get rid of it. I just have to say that Frans has got the perfect radio voice. Seriously! He also throws some pretty nice ceramic forms! I have learned that he also teaches too. It was nice to finish my project by photographing another potter. My first stranger was a NYC police officer, but his portrait was streaked with bad light leaks. Hence the beauty and the chances you take when shooting film. My son decided to spend some of his coins on buying more coins from this vendor, named David. Too bad we can’t use most of those coins again, like the French franc in France, I think we can still use the 2p coins that he picked out though (UK peeps, is that a yes?). Since it was near the end of the day for the market, I could see that David was taking a bit of a break before packing all of his gear away. I took the opportunity to tell him about the 100 Strangers Project and how close I was to finishing. Yes, I am grateful that he agreed!! 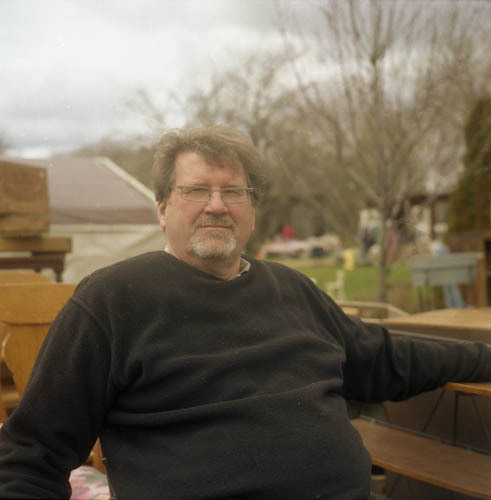 David has been a vendor for 30 years selling antiques at Aberfoyle and he has pretty much seen it all. The next time I go vintiquing, I’ll see if I can get any good gossip on the most unusual things he has sold. Thanks David! Getting so close to finishing this project with the help of local vendor, Brian! He has a great look and his portrait is brilliant!! So turns out, Brian owns the local sugar shop in Guelph called Sweet, right across from the splash pad and city hall. Brian and his wife also run a great stall at the antique market too. Turns out that Brian and I have many mutual friends, but this was the first time we both actually said “Hello, my name is…..”. Now I will be able to say “Hello Brian!” when my boychik drags me into Sweet (mind you, I do enjoy the odd Curly-Wurly every now and then).